There seems to be a little confusion on how the factory in Schorndorf got started mainly because Danckert in his book on European Porcelain claims that the factory was founded by Bauer, Rosenthal & Co. and gives two possible founding dates, 1902 and 1904. However it was more than once proven that the founding year was 1904 and that Bauer, Rosenthal & Co. had absolutely nothing to do with it, as that partnership had ended when C.M. Bauer quit the company in 1903 and left the former factory in the town of Kronach to Rosenthal. The business in Schorndorf was founded 1904 by C.M. Bauer and his new partner, businessman Pfeiffer who originated from the town of Stuttgart. Viewing the mark registration info shows that the first marks used by the company had been filed for inclusion during July 1904, resulting in first registrations in November 1904. The local museum shows that 'Bauer & Pfeiffer' started production in August 1904 and at least one source mentions that C.M. Bauer already passed away in 1905. 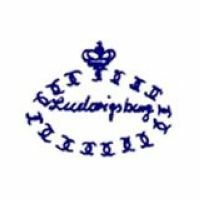 The product range at first included fine coffee and tea sets as well as dinnerware, some of which either carried the mark stating 'Alt-Ludwigsburg' or showed a mark similar to the Ludwigsburg crown mark in recognition of the fine sets made in Ludwigsburg. 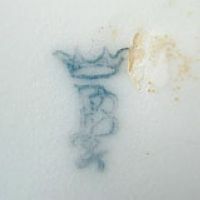 Even if this procedure was not legally secured, the Prince of Württemberg did not intervene as the marks did differ in a way that made them easy to identify. Based on the experience with normal household sets the company also started experiments with hotel porcelain in 1910 which proved successful. The business grew quite rapidly, soon exporting goods and showing a total workforce of 200 people in 1913. As business was very promising, the company was transformed into a (stock) corporation in 1917. Before the transformation, the company had applied for the use of marks related to the ⇒Herzöglich-Königliche Porzellan-Manufaktur Ludwigsburg that had been closed in 1824 and as the company manufactured a completely different product line than the well known but long closed factory, they were allowed to use the old Ludwigsburg marks from 1918 onwards, but had to add the initials 'WPM' for 'Württembergische Porzellan-Manufaktur'. 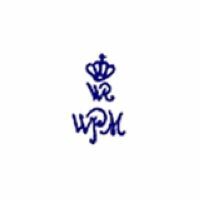 The company was eager to comply and had all marks registered showing the 'WPM' addition. 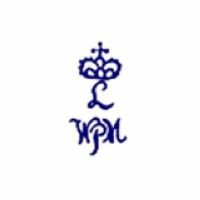 During this time problems with the chief decorator Zawatzki escalated as he wanted to copy the marks directly (omitting the 'WPM' addition), stating they had been copying the marks and using the name 'Alt-Ludwigsburg' all the time anyway. 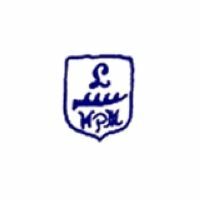 After being reprimanded yet again, he left the company and moved to Ludwigsburg to open his own company with the name of ⇒Porzellan-Manufaktur Alt-Ludwigsburg G.m.b.H. in February 1919. This of course lead to legal consequences as his former employer was by now officially entitled to use the variation of the Ludwigsburg marks and called for intervention by the district court on June 13th 1919. 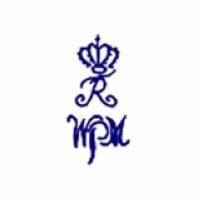 It is not known if the Prince of Württemberg influenced the proceedings, but the offending company owned by Zawatzki was forced to drop the name of 'Alt-Ludwigsburg' and change its marks as per second court decision from December 12th 1919. Even if the company in Schorndorf had successfully secured its rights, it could not prevent Zawatzki from adding a 'Ludwigsburg' in his new mark, but it was so destinctive that it could not be confused with the Schorndorf marks anymore. 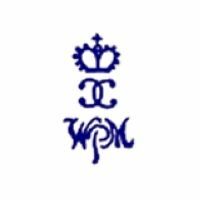 Under the privilege of using the official Ludwigsburg trademarks the company in Schorndorf was quite successful for some time, but then ran into financial problems and had to close. The mark dates given by Robert Roentgen in his book "Deutsche Porzellanmrken 1710 bis heute" are incorrect. I have corrected this entry accordingly; thanks to Walter P. Merklein for pointing me towards this error. 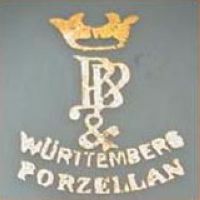 Württembergische Porzellanmanufaktur A.G. also registered the mark 'VIRTEMBERGIA-PORZELLAN' for the domestic market; it was used between 1918 and 1934. Another mark, shown here as Image 1/2-05, was most commonly used on items with the decorations numbered 1756 and 2188. So far I know of only one dedicated export mark. 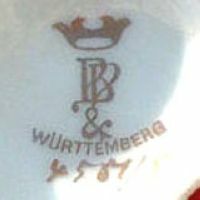 Next to the standard crowned initials B&P together with the addition 'ROYAL WURTEMBERG' one can find by far more items merely marked 'ROYAL WURTEMBERG' alone, with owners often clueless about the true maker of their items. Used between 1904 and 1934, was registered at the ⇒R.W.Z.R. under file №·73·724 on November 9th 1904. 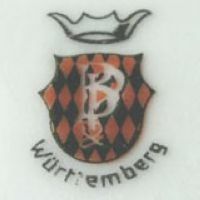 Used between 1904 and 1934, here a clearer version with 'WÜRTTEMBERG' addition. Used between 1904 and 1934, here with 'WÜRTTEMBERG' and 'PORZELLAN' addition. Used between 1904 and 1934, here a multi-colored version. 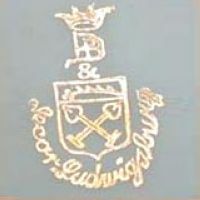 Used between 1904 and 1934 and only in gold, writing states 'DECOR LUDWIGSBURG'. 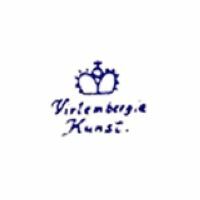 Used between 1904 and 1918; writing reads 'VIRTEMBERGIA KUNST'. Mark is normally completely gold and writing in black is rare. Used between 1918 and 1934, registered at the ⇒R.W.Z.R. under №·224·480 on June 4th 1918. Registered at the ⇒R.W.Z.R. under №·228·751 on January 24th 1919 but never used. Registered at the ⇒R.W.Z.R. under №·228·752 on January 24th 1919 but never used. Registered at the ⇒R.W.Z.R. under №·228·753 on January 24th 1919 but never used. Registered at the ⇒R.W.Z.R. under №·229·487 on February 15th 1919 but never used. Used between 1918 and 1934. Registered at the ⇒R.W.Z.R. under №·280·744 on February 18th 1922.